TELEHOLDER is a phone mount that attaches to the dashboard of your car by suction cup. It has a telescopic arm and adjustable grip where the phone sits. 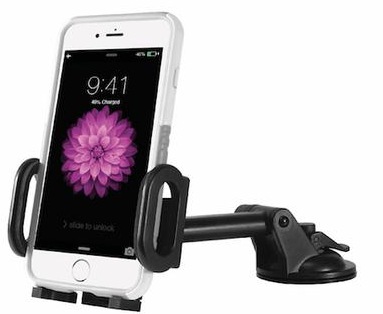 MCDMAG is an auto CD slot phone mount with a magnet holder, also designed for hands-free iPhoning while driving. 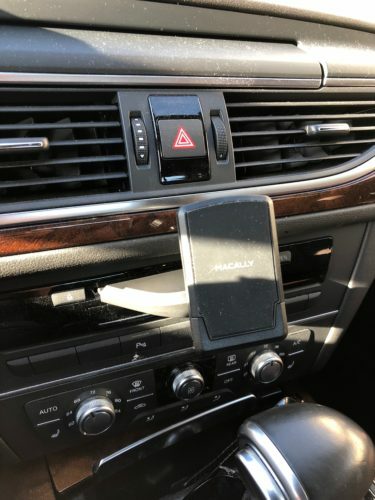 MCDHOLDER is a car CD slot mount for phones with an adjustable grip for the phone. All holders come packaged well with clear instructions for assembly. TELEHOLDER comes out of the box in three parts: the base, the telescope and the phone holder. Putting it together is an easy task that includes snapping the holder to the telescope and screwing in the holder and base. The bottom of the telescope has a removable sticker that exposes a very sticky surface that sticks to the windshield glass. There is a suction cup on the bottom that will attach the whole unit to the area of the car you want to mount it. MCDMAG comes out of the box fully assembled. It has four magnets and three size adapters that can accommodate different size CD slots. The magnets attach to the back of your phone or to a rear of a phone case if it’s able to stick. The unit then gets inserted into your car’s CD slot and then you close the lever to tighten. If the CD slot is too large, you can use one of the labelled adapters to widen the area that gets inserted. Lastly, just place your phone to the magnet and you are set. 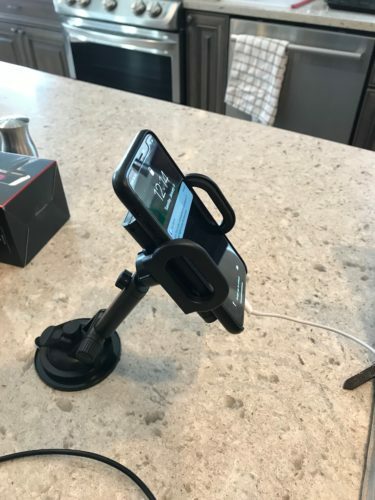 MCDHOLDER is almost exactly the same setup except instead of the phone attaching with magnet, it is held with an adjustable grip. It comes with the same size adapters but does not come with the magnets. All tests were done with an iPhone X and an 2015 Audi A6. I have spent many years going through many mounts to find the perfect solution. I found that my recent preference is using the CD mount with an adjustable phone holder. Magnets are very convenient and easy, but attaching the magnet to your phone or case becomes messy. 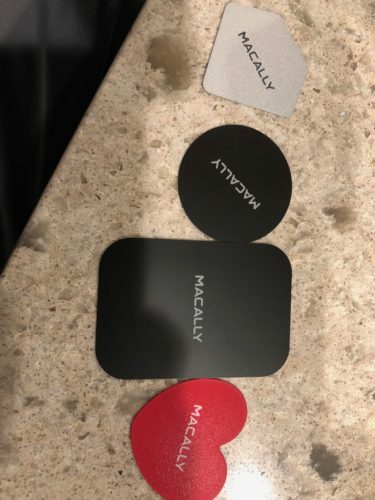 There was nothing surprising or difficult using the Macally mounts, which is a good thing. Car mounts should be easy to use, hold the phone in place and be able to move as needed – and these mounts did the job. Both of the CD mounts attached to my CD slot with no issues and held in place. The TELEHOLDER attached to my windshield and stayed in place. 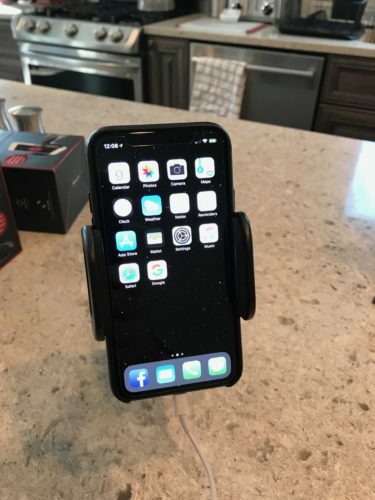 All mounts felt very sturdy and I was never worried about my phone detaching. The included magnets were easy to apply and looked good. Instructions were clear, and the ability to install and use is easy enough where you probably won’t need to spend much time with the directions. MyMac Review Rating is 8 out of 10. 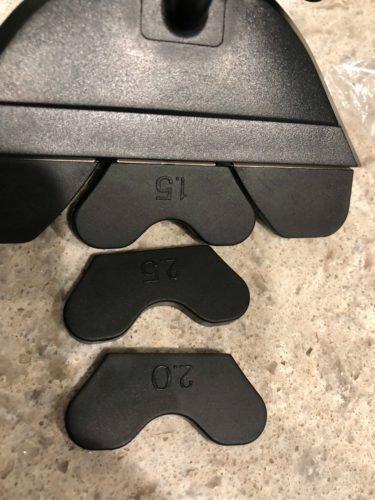 Well made, sturdy and priced affordably, these mounts will do a great job no matter which model you choose.